A BIG 'thank you!' to Beth Ling and her girls who took our small mountain of schools supplies and a cash donation of $200 to 'Crayons to Classrooms'. (Note that Beth's daughter is sporting a KRC T Shirt! Way to go!) KRC is proud to support so many local students and teachers with our donations, financial support, literary programs and mentoring. 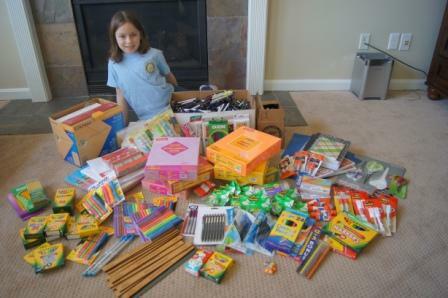 This is our first year with the Crayons to Classrooms supply drive and I'd say it was quite a success!